If you’d like to know what the Pokémon fuss is about, but don’t know how to get started (read: me, about five days ago), I can get you addicted teach you. As a recent newbie to the Pokémon world myself, I’ve gathered the questions and answers I’ve been searching for (and getting from other parents whose kids are now playing). Think of it like a treasure hunt—only the treasure is Pokémon. You “find” them in the real world by using your phone and essentially by playing the “hot or cold” game like you did when you were a kid. Only in this case, the app tells you visually whether you’re hot/close to the Pokémon or cold/further away. The goal is to find all different kinds of Pokémon, “evolve” them to make them stronger, and then win virtual battles with other people’s Pokémon. What is a Poké Stop? It’s a place in real life where you can visit to get free virtual items to play the game. (Yes, this is why you’re seeing people on their phones by parks, or buildings, or local landmarks/points of interest.) On your screen a Poké Stop looks like two blue floating boxes tethered to the ground. As you get close enough to score some freebies from the Poké Stop, the top box will turn into a circle. Press on it, and then spin the image for free stuff. Tip: If it looks like there’s pink confetti around a Poké Stop, it means someone hooked a lure there to try to attract more Pokémon. As such, you might want to hang around :-). Then what’s a Poké Gym? 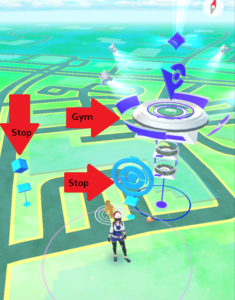 Gyms are the fancy, multi-level spots with a spinning tops you see on your screen. Once you’re a Level 5 trainer, you go there to train your Pokémon and battle others (virtually, of course). The gym’s color reflects what team is currently controlling it. If the gym is the same color as your team: you can enter and train. This helps give you more experience points and boosts your team’s hold on that gym. If you visit a rival gym, you battle and, hopefully, help your team take it over. How do you find Pokémon? You do a lot of walking or biking. But, you don’t just have to wander at random. By opening the “nearby Pokémon” in the lower right corner, you can roughly how far away they are by the number of footprints. If there is only one (or zero) footprints, you’re close. If there are three, it’s farther away. The Pokémon in the upper left corner is closest; the one in the lower right is the farthest. Tip: The green blowing leaves indicate that a Pokémon might spawn in that spot, so if you’re not sure which direction to turn, head that way. Battling and training (varies depending on how well you do). There are other ways too, though. Quartz has an exhaustive chart. 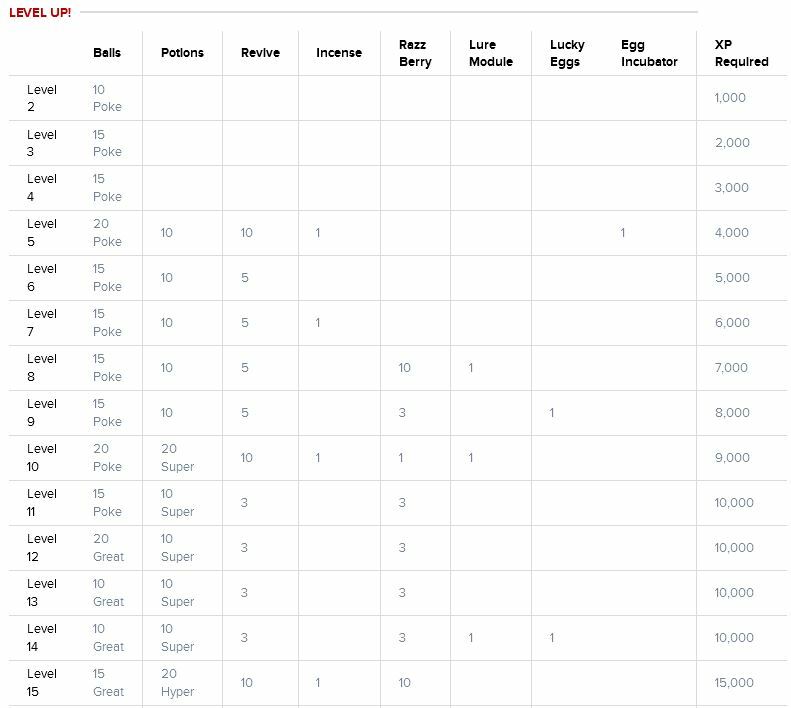 Also, don’t forget about Lucky Eggs—if you get one at a Poké Stop use it to collect double the XP for each capture for a half hour. Tip: Pair Incense or a Lure with a Lucky Egg to really score. If you really want to know the details, check out CNET’s chart – it’s pretty great. Levels 1-15 show here, but they have all 20! For each Pokémon there are Combat Points (CP) and Hit Points (HP). CP =how much damage your Pokémon dishes out during a battle. If you upgrade one, you get upgrades on the other. To evolve your Pokémon you need Candy – and not just any candy. You need the type of Candy for that particular Pokémon type. You get it by collecting more Pokémon of that type. If you have too many of the same Pokémon, you can “Transfer” that Pokémon to the professor in trade for another piece of Candy. Tap on the screen for a standard move. Long press to do your Pokémon’s special move, only if the blue bar under your Pokémon’s HP is full. Swipe left or right to dodge an oncoming attack. Tap the arrows in the bottom right of the screen to swap your current Pokémon with another. Try not to stress. Although you have to restart the app, it usually only happens when you have caught the Pokémon. If you reopen the app, you’ll probably see it in your journal. Oh! And rumor has it that if you have an iPhone 6 and you turn your LTE off, it might happen less frequently (but I haven’t tried this myself). That may depend on the eye of the beholder. There are concerns about kids being lured into dangerous situations and reports of injuries due to inattention—people falling off curbs, walking in front of cars, etc. Plus, there were some initial concerns about how much information you were sharing with the game inventors. As for privacy the app’s concerns, make sure you’re running the latest version and, the tech press is saying, “don’t believe the hype.” Engadget just published a story saying that while the initial permissions were set poorly, it was corrected almost immediately with an update. Another quick tip. As you throw a Pokeball at a pokemon you will notice the ring around the pokemon. The color indicates difficulty but there is a trick in that ring. If you land a pokeball in that inner ring you increase the chance to catch the pokemon. However the smaller the inner ring the better. Also as stated a green ring indicates easy to catch. Orange more difficult and Red being hardest. May be more than that but thats my extent of knowledge at this point. More info is out there on the web.